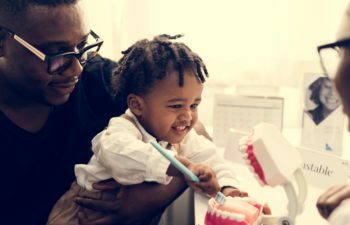 Does My Child Really Need To Visit The Dentist By Age 1? The Academy of Pediatric Dentistry recommends that you bring your child to the dentist by the time they reach their first birthday. With so few teeth at this stage, it is common for parents to question whether or not this first visit is really necessary. However, the first dental visit serves several purposes that will benefit your child’s oral health both now and as they grow. At Georgia Orthodontics & Children’s Dentistry, we have an experienced pediatric dentist Dr. Justin Chong, who will perform thorough examination of the mouth, teeth and gums. Pediatric dentistry is focused on preventive measures to ensure ongoing dental health. Dr. Chong will be examining the health, placement and growth of the primary teeth, and provide a consultation to you as a parent on how to best care for your child’s teeth. It is very common for children to have anxiety about going to the dentist. By bringing them in the dental office at such a young age, you have the opportunity to establish a positive and rewarding association with the dentist. You may even find that your child looks forward to going to the dentist as he or she gets older, which is a valued advantage for you and your child’s oral health. In addition, your child can begin building a trusted relationship with the dentist. This typically encourages children to stay on top of their dental health in between visits. Even though your child is not eating hard candy or brushing his or her teeth on their own yet, you can still benefit from what your dentist has to say about good oral health habits. There are habits that need to be established at all stages. For example, it is important that babies and toddlers avoid bottles in bed and that parents wipe down their gums on a consistent basis. You may also want to ask your pediatric dentist about pacifier use or thumb-sucking. Just because your child’s teeth are brand new, doesn’t mean they aren’t susceptible to damage. Unfortunately, there are alarming statistics of increased cavity rates among preschoolers. Kids as young as 2 can develop serious tooth decay, which can cause them to miss school and suffer associated overall health problems. Every baby tooth matters, as these primary teeth hold the place for permanent teeth and allow a child to eat correctly and develop proper speech. If your 1 year old is due for a dental visit soon, don’t talk it up too much. Although you may mean well, your child doesn’t have a reason to be afraid or anxious at this young age. Treat the appointment as routine and comfortable so that they can relax. If your child needs a lovey to feel more secure, please bring it along. At Georgia Orthodontics & Children’s Dentistry, we will do everything we can to create the most rewarding and fun first visit possible.